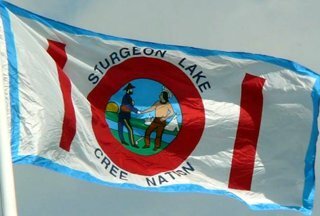 The Sturgeon Cree Nation is a First Nations band, part of the Cree ethnic group, a member of the Western Cree Tribal Council, and a party to Treaty 8. 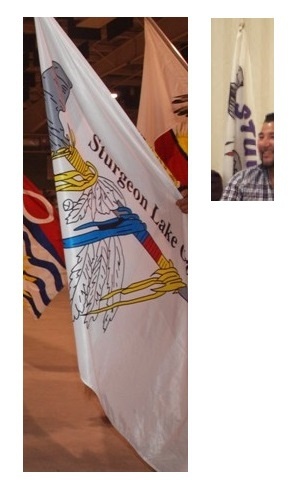 The band controls three Indian Reserves, and is based on the shores of Sturgeon Lake, around Calais, west of Valleyview, in the M.D. of Greenview in the Peace Country of Northern Alberta. The current flag is white with a decorated pipe extending across it. Image above based on this photograph. Earlier images captured appears to indicate another flag has been used - from which elements are also visible as a combination in this image. Originally posted by www.auroraflags.com (image no longer available), the flag is white, with a blue border. In the center is the band logo in a red ring, with red bars on either side, and the name written above and below the ring.